One of the most respected NHL stars of the 1990s, Doug Gilmour cards and autographed memorabilia remain relevant today. He played for seven different teams during his 20-year career. Gilmour's ability to score and play with a feisty intensity made him popular fans, particularly in Calgary and Toronto. 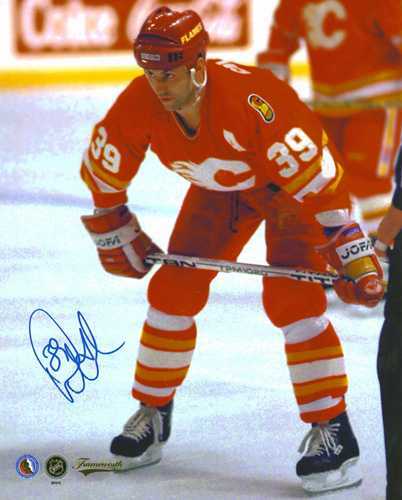 He would captain three of the teams he played for and win a Stanley Cup while with the Calgary Flames in 1989. He scored 450 goals in the NHL and was an excellent defensive centerman. 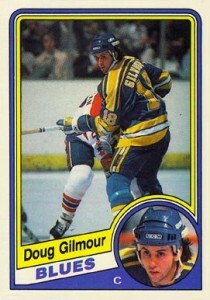 Gilmour's sole rookie card is from the 1984-85 O-Pee-Chee set. He is not on the smaller 1984-85 Topps Hockey checklist. The first certified Doug Gilmour autograph card was issued in 1993 by Classic. It has a print run of 1,850 copies. One of his most popular early autographs is in 1994-95 Be A Player and has a print run of 1,250. Gilmour's first game-used memorabilia card was issued as part of the 1996-97 Upper Deck Hockey set. He is was a willing in person signer during his career. He currently participates in the occasional organized signing event. Autographed jerseys and photos can be found for every team he played. With no Topps issue to compete with, this is the only Doug Gilmour rookie card. As was the case for several O-Pee-Chee sets, it can be difficult to find with good centering and clean edges. 2017-18 UD MAPLE LEAFS CENTENNIAL DOUG GILMOUR MAPLE LEAFS MATERIALS #ML-DG "A"! 2017-18 LEAF PEARL HOCKEY LETTER OR LACE DOUG GILMOUR 1 4 SP! 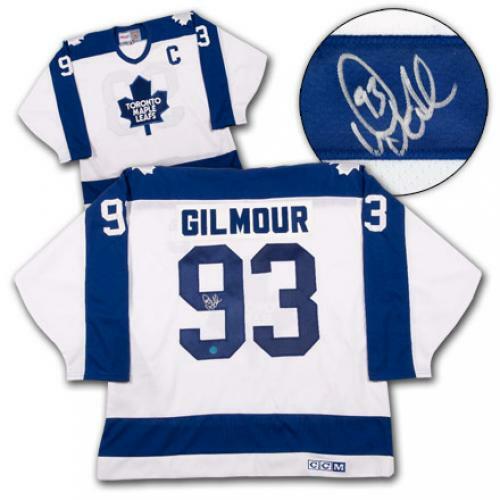 Below you will find an example of what Doug Gilmour's authentic signature looks like. This can be used as a first point of reference for determining the legitimacy of autograph memorabilia, but is not a substitute for having your items authenticated by a well-respected professional autograph authentication company. Some of the trusted sources within the sports memorabilia market include the following companies: PSA, JSA, Tristar, and Mounted Memories. Click on any of the images below to view full size photos. The signature is very brief. It is defined by the "D" that, most often, contains his jersey number "93." The shape of the "D" itself is rather egg-shaped. The rest of the letters are not legible. Look for a lower case "w" shape below the "D."
Also look for a "v" shape connecting to the left of the "D."